With our big trip looming on the horizon (departing in t minus 6 days! ), it’s made us think about how much we’ll miss our wonderful home right here in Encinitas, California. It’s been my home for about three and a half years, and Eric has called Encinitas home for most of his adult life. We’re starting a series on Lush Palm called “Home Break” where we’ll feature mini city guides by local surfers. The guides will cover surf breaks, grinds, places to stay, and top things to do in the area (when you’re not surfing). 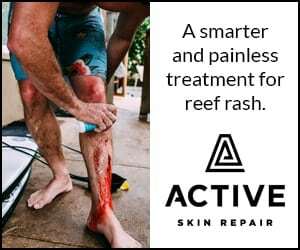 This way you can get local insights on different surf towns all over the world from the best source: your friendly local surfer dude or dudette. I figured we’d kick off the series with our home and one of our very favorite towns in the world: Encinitas! Encinitas is the quintessential southern California surf town. Plenty of super fun surf breaks, mellow vibes, and sun-kissed active beach people everywhere. 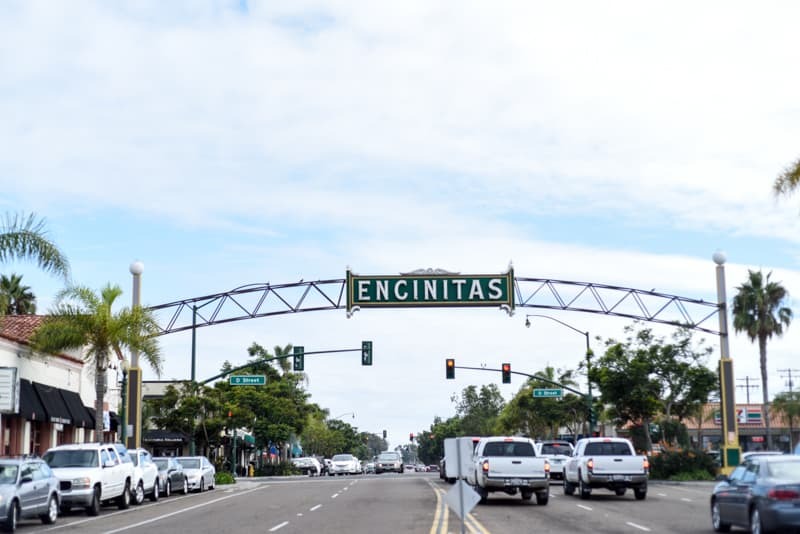 Despite Encinitas’ development and growth over the past twenty years, it’s managed to maintain a charming small town feel. And even though we live and work here, I pretty much feel like we live on vacation :). 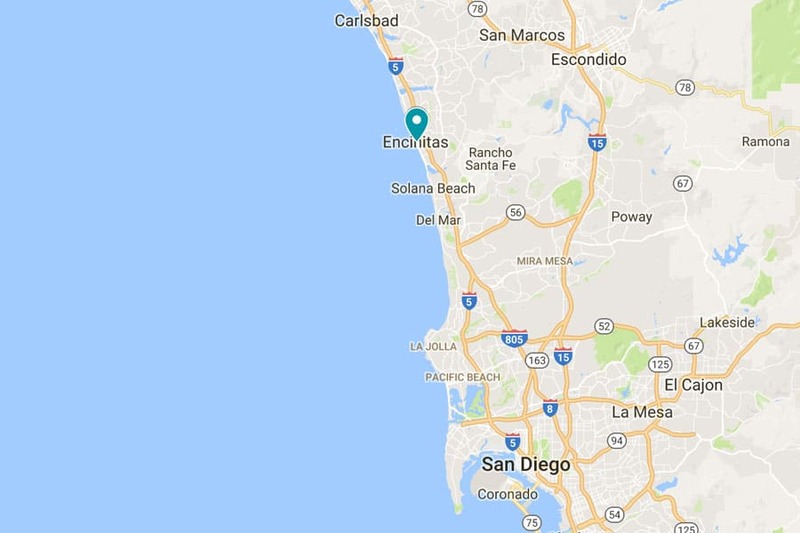 Encinitas is located in San Diego County in southern California, about a two-hour drive south of Los Angeles, and about a 30-minute drive north from the city of San Diego. The cluster of beach towns along the northern San Diego coast is appropriately dubbed “North County.” North County stretches about twenty-five miles from Del Mar to Oceanside and includes (from south to north along the coast) Del Mar, Solana Beach, Cardiff-by-the-Sea, Encinitas, Leucadia, Carlsbad, and Oceanside. Leucadia is just north of downtown Encinitas, and Cardiff-by-the-Sea is south of downtown Encinitas, but both towns are considered to be a part of the city of Encinitas as a whole. There’s a whole lot of fun breaks in North County, and Encinitas surf is no exception. Some breaks are more localized than others, but typically the vibe in the water is pretty friendly as long as you’re respectful. GRANDVIEW is a true wave magnet. 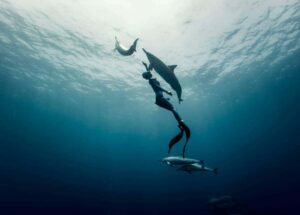 It picks up just about anything that the great blue Pacific has to offer. 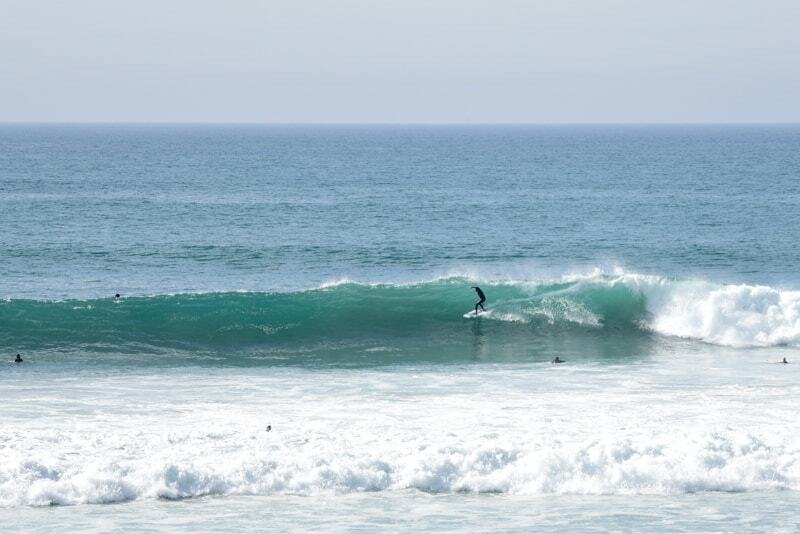 Southwest swells, northwest swells, combo swells, you name it, there’s usually something to surf here any time of year. It is a slow, often mushy, but still rip-able wave and suitable for all abilities. 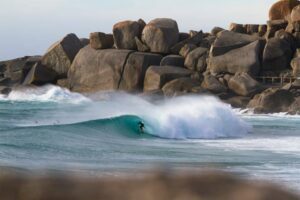 You’ll have a good time on a shortboard or a longboard but due to the slower fatter nature of this wave, some extra foam or your small wave equipment will most often serve you well. Lefts and rights are available. Southern California crowds to be expected. D STREET is a fun, punchy beach break that is best on SW/NW combo swell. It breaks year round but the spring and fall are when the combo swells are most common. There are peaks up and down the beach so you can choose your crowd accordingly. D Street is directly next to Moonlight Beach, they’re basically the same beach and definitely the most populated beach in Encinitas during the summer months. Teeny boppers line the coast and you’ll find most of the local high school surf teams in the water at any given time. D Street is best stomach to head high. It starts to max out a couple feet overhead. SWAMI’S is the kind of the place that you find yourself in a love/hate relationship with. On a good day, it’s a world-class grade right reef point break, but it usually comes along with the entire surfing population of North County and a few greedy longboarders which can be frustrating. Swami’s prime season is winter, but with the constant mix of NW swells that we get in Encinitas in the Spring and Fall, it can get very good just about any time of year. Summer is the worst season since it doesn’t pick up south swells, but it can still muster out some pretty fun days since it doesn’t take much of a NW windswell to do its thing. The Swami’s parking lot is on the south side of the Self-Realization Center where you’ll find the local community just hanging out, slacklining, lounging, playing music, and celebrating the good life. It’s a cool place to see with good vibes. CARDIFF reef is the kind of the place that can be fun for the whole family. You’ll find a variety of well equipped beach-dwelling households posted up in the day use parking lot in their campers making an all-day event out of it. Cardiff typically breaks right and left, with the rights being the main attraction. It’s also a slower cruise-y wave which is mostly dominated by quite the stylish crew of longboarders, but you’ll find a handful of willing short boarders and children of all ages ripping it up out there too. MOZY CAFE has healthy Caribbean-inspired breakfast and lunch served up in a tiny colorful cafe. Great vegetarian options. Obsessed with the breakfast burrito with grilled plantains (The Tropical) and chipotle salsa. Awesome acai bowls and vegan chocolate chip cookies. LOFTY COFFEE makes seriously delicious crafty coffee. There are two locations in Encinitas right across the street from each other. The original location on the west side of the Coast Highway is smaller and offers a full menu, and the newer location on the east side has more tables and offers a limited menu. Both are equally tasty! THE TACO STAND makes fresh and yummilicious tacos and burritos in a casual indoor/outdoor space in the heart of Encinitas. With handmade corn tortillas, fresh salsas, and great prices, The Taco Stand is a favorite for locals and visitors alike. PANDORA’S PIZZA is a casual kid-friendly order-at-the-counter spot with fresh salads, gourmet pizzas, local craft beer on tap, and outdoor seating. Our go-to’s are the Penthos salad (mixed greens, fresh berries, candied pecans, and basil vinaigrette) and Daphne pizza (jalapeños, sun-dried tomato, basil, and prosciutto). PANNIKIN COFFEE & TEA serves up coffee, tea, and freshly-baked goodness from a historic Santa Fe Railroad Station that dates back to 1888. Located right on the Coast Highway, Pannikin is a great place to sit outside and sip your morning beverage of choice in the sunshine. 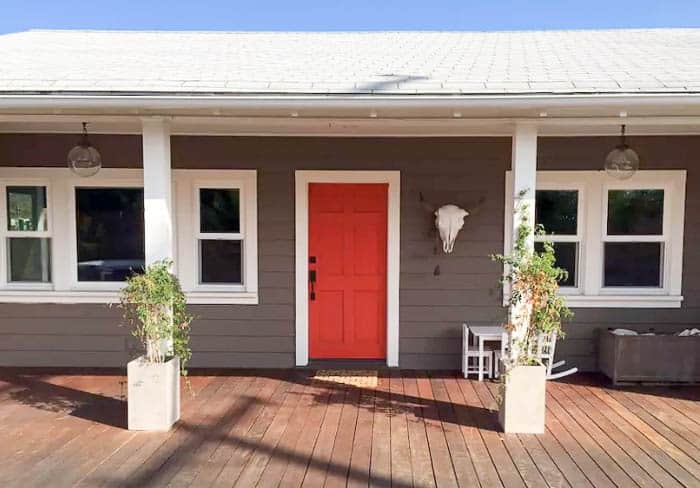 Encinitas has your standard box hotel fare, a couple of kitschy B&Bs, and one surf-inspired boutique hotel. 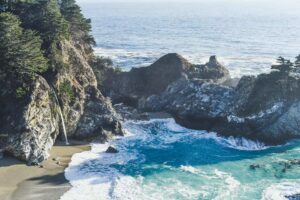 We’d also recommend checking out the great selection of Airbnbs or getting your camp-on at one of the best coastal campsites in California. 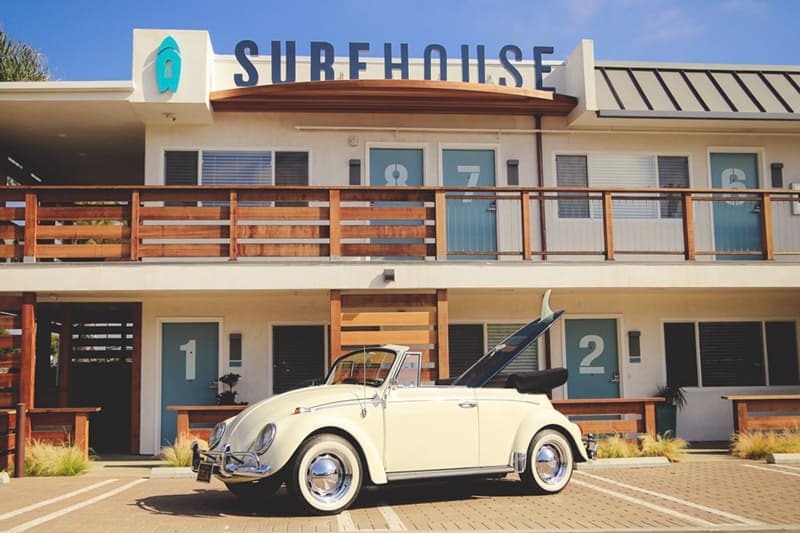 SURFHOUSE is a modern surf-inspired boutique hotel in Encinitas. 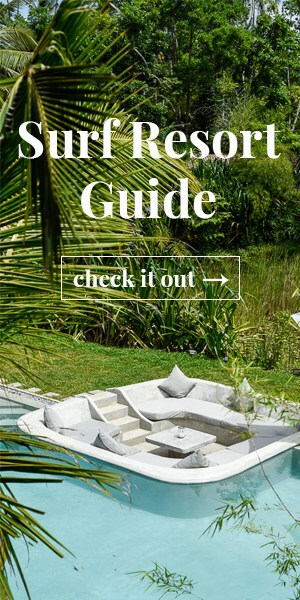 Opened in 2017 by two local surfers, Surfhouse has it all: thoughtfully designed beach-chic rooms, complimentary beach cruisers, surfboard rentals, and a perfect location–about a 3-minute walk to the closest break, and a 10-second walk to the closest cup of joe and surf shop. 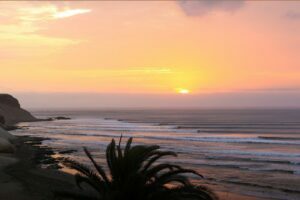 The hotel also offers week-long surf camp packages for surfers of all levels. 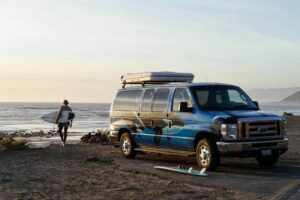 SAN ELIJO CAMPGROUND is one of best campsites on the California coast for surfing. Located on the bluffs next to the Coast Highway, what it lacks in privacy it makes up for in location, location, location. On one side you have the ocean of course, with a handful of great breaks you can easily walk to. And on the other side is the little town of Cardiff-by-the-Sea that you can also walk to for groceries, restaurants, surf shops, acai bowls, donuts, and coffee. Campsites with ocean views: 145 through 171. These campsites book up early so make a reservation well in advance. CARDIFF BY THE SEA LODGE might have been what I was referring to when I wrote “kitschy.” Yeah, it was. This little bed and breakfast has some serious kitsch happening, but the location is great and they have a lovely rooftop garden complete with views and a little hot tub. 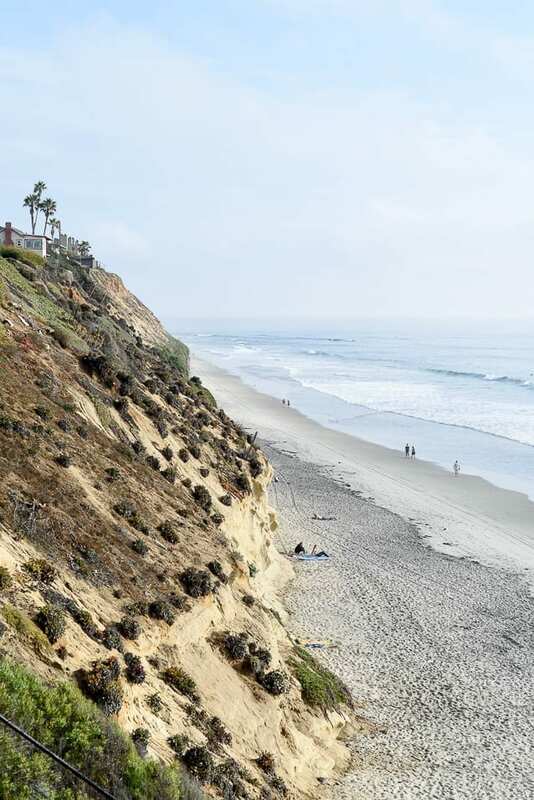 As with a lot of beach communities, much of the things to do in Encinitas revolve around the ocean and beaches. So of course you can (and should) surf, picnic, and spend hours living it up on the beach. When you need a break from the sun, here are some things to do in Encinitas besides surfing and beach days. THE MEDITATION GARDENS AT THE SELF-REALIZATION FELLOWSHIP are up on a bluff with gorgeous views of the coast and Swami’s break. Take a stroll in the gardens, or meditate amongst waterfalls and koi ponds. LEUCADIA FARMER’S MARKET is on every Sunday from 10am-2pm at the Paul Ecke Elementary School. The market has over 75 vendors with amazing flowers, fresh organic produce, specialty foods, local artisans, and a food court with lots of delicious breakfast and lunch options. SAN ELIJO LAGOON is a 979-acre ecological reserve where the Escondido and La Orilla Creeks meet the Pacific Ocean. Explore 7 miles of easy to moderate trails along one of the county’s most diverse coastal wetlands, or bring your little ones to the nature center to learn about the history and ecology of the lagoon. LA PALOMA THEATRE is a beautiful historic theater that opened in Encinitas in 1928. Today, the theater has a rotating roster of great indie films, surf movies, and the Rocky Horror Picture Show in 35mm every Friday at midnight. Cash only. STONE BREWING WORLD BISTRO AND GARDENS is a restaurant and one-acre beer garden in Escondido. That’s right, I’m totally cheating and this isn’t in Encinitas at all. It’s about a 30-minute drive from Encinitas, but it’s an awesome afternoon trip if you’re a beer fan. There’s a lot of craft beer and breweries all over San Diego, but Stone’s Escondido location is one of the best. Eat lunch in their huge open-air restaurant, sip a brew or three next to waterfalls in their lovely gardens, or take a brewery tour. Or do all of those things. They tend to get quite busy so consider a reservation. SEAWEED AND GRAVEL is one part clothing boutique, one part surf/skate shop, one part custom motorcycle shop, and all parts very cool. 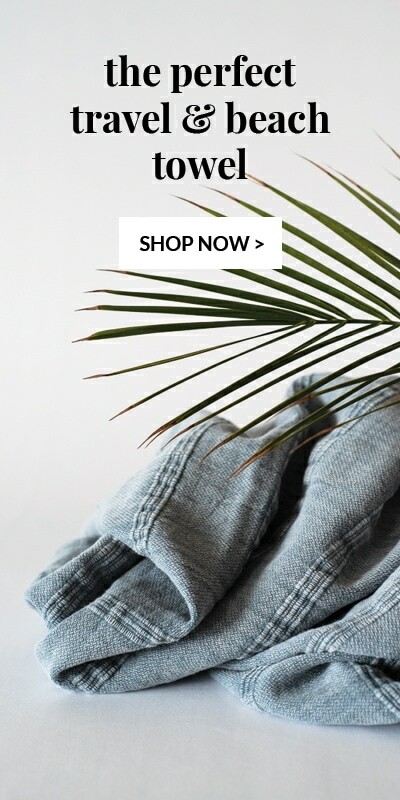 VUORI is a local activewear brand and store in downtown Encinitas. They make sustainable and stylish beach-inspired clothing for active guys and gals. Boardshorts made out of upcycled coconuts never looked so good. Read more about Vuori in our write up here. SURFY SURFY is a self-proclaimed “Mom and Pop surf shop” that slings a good lookin’ collection of handcrafted boards made in California. 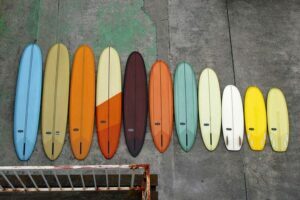 PROGRESSION SURF stocks hundreds of new and used surfboards for your surfboard-loving pleasure. This is a great place to pick up a used board at a decent price. 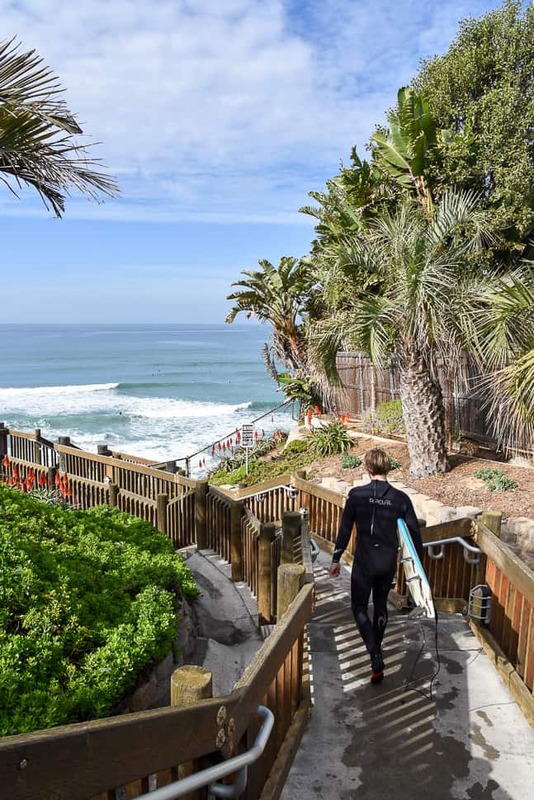 As you can see, there are a lot of awesome things to do in Encinitas, and heaps of fun surf–these are just a few of our favorite spots! For more info on surfing California, check out our surf trip guide: Surfing California/ Everything You Need to Know. Hope you enjoy the Encinitas surf life, and let us know if you have any questions! P.S. We also have multiple other articles and guides on California, so search ‘California’ in the sidebar, or check out a few of our related posts below. Happy travels! This is awesome and so true! I live in South County but I work in Cardiff so I hit the reefs most every day Those are pretty crowded too for anyone wondering – lots of groms on shortboards and longboards alike so I would recommend DEFINITELY getting out before school lets out in the fall, winter, and spring.